Many people do not know this but I’ve been licensed to ride a motorcycle in California since 1999. 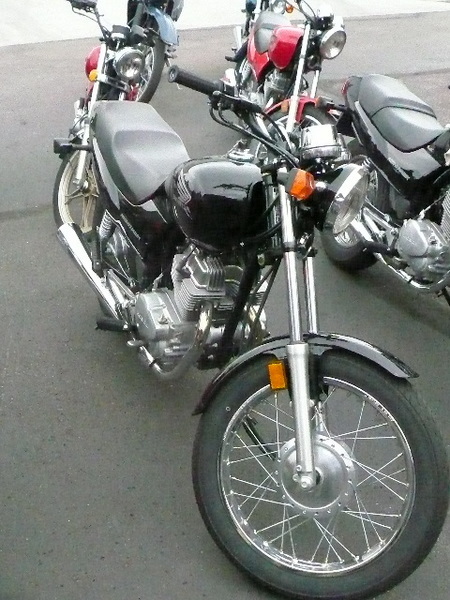 I never purchased a motorcycle out there due to my wariness about riding on gridlocked streets among stressed-out, road-raged drivers, but moving to Fort Collins (#2 safest drivers in the U.S.)—along with experiences last year with motorbikes in Vietnam—has rekindled my interest in motorized two-wheeled machines. I thought it was a good idea to refreshen my riding skills, then. 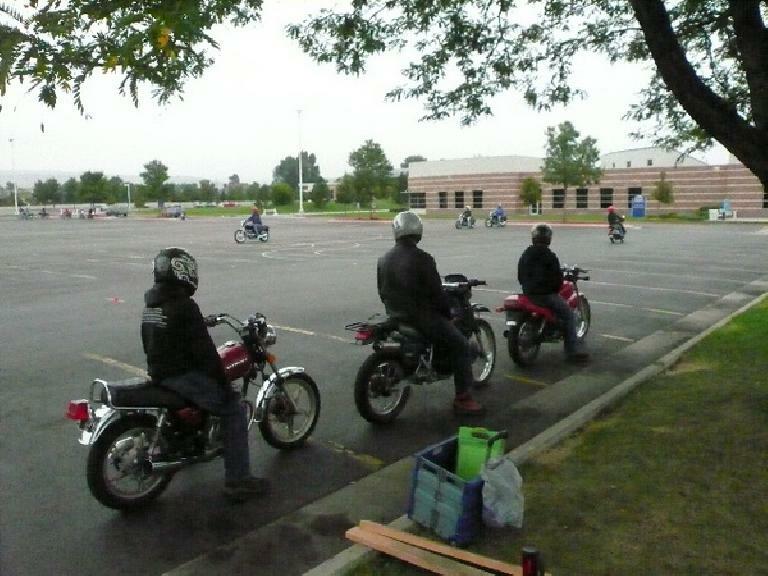 I signed up for a motorcycle skills class held by ABATE of Colorado at the Front Range Community College. Included in the class were about seven hours of classroom discussion and ten hours of on-bike time. 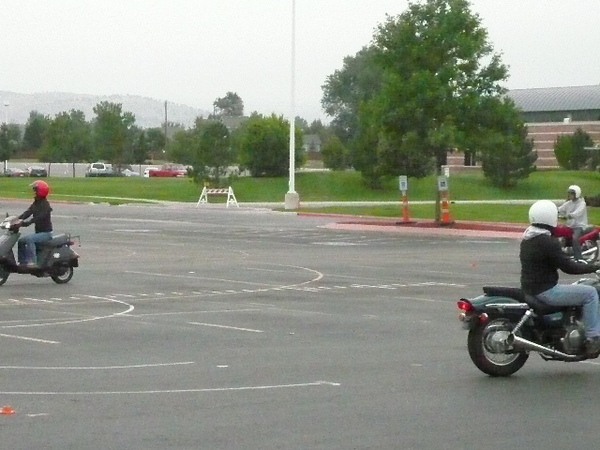 In-class teaching was conducted in a “find the answer to these questions in the book” format, with videos by the Motorcycle Safety Foundation shown now and then to emphasize safe riding habits. The classroom portion was punctuated with a 50-question exam which we had to get 80% correct. Exactly like in 1999, I passed with a 100% score all while finishing before everyone else, demonstrating that at least I am still good at taking written tests! 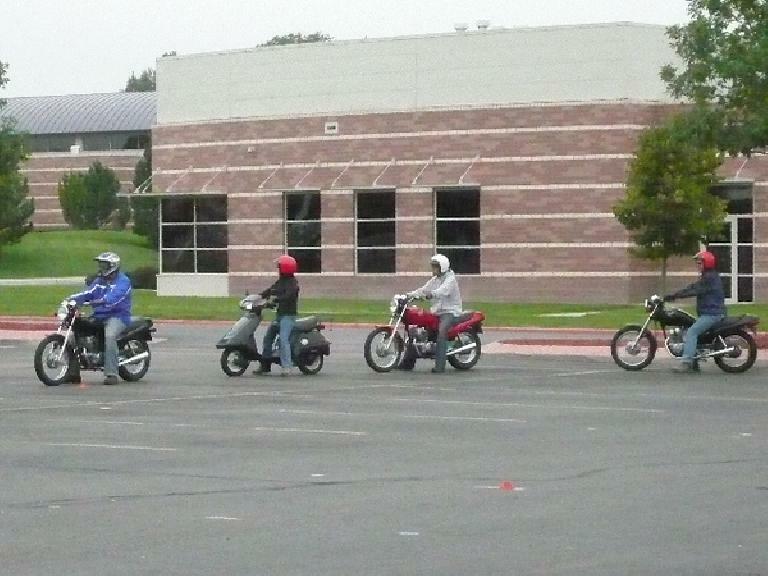 The on-bike skills portion of the class, of course, was more interesting and useful. 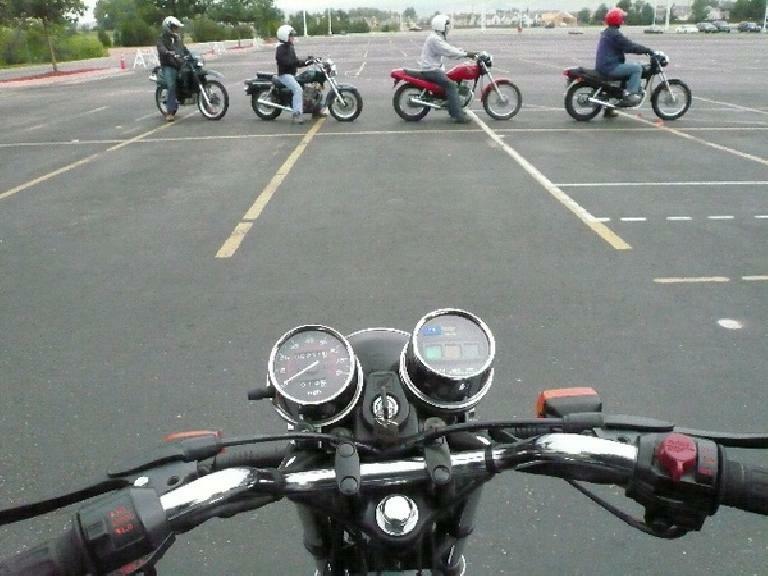 We started out by practicing modulating the clutch and throttle controls to “walk” the bike, and graduated to actually riding the bikes in a coned-off area of the college parking lot. Negotiating tight turns, including 90- and 135-degree ones. Instructors Reggie and Barbara emphasized looking through the turn with the head up (and never at the cones!) and rolling on the throttle through the turn. They also talked about following an “outside-inside-outside” path around the apex. Hard braking. This was actually more complicated than one would think, since every single limb is squeezing or pushing a lever. The right hand squeezes the front brake lever and the right foot puts steady pressure on the rear brake pedal. Meanwhile, the rider needs to downshift, using the left hand and left foot. As with a bicycle, 70% of all braking power is with the front brake. It’s harder to go over the handlebars on a motorcycle under hard front braking, though, since the motorcycle is heavier. Weaving and quick lane changes. We used the turn-signal switch in this one, which I’d have to practice more. Using a tiny, sliding turn-signal switch is much different from flipping an automobile turn-signal stalk up and down. U-turns! Many people in the class struggled with this one, but I didn’t find it too hard. The key for me was really turning the head to look were one wanted to go and counter-steering much. By being more aggressive in class, he reasoned, one climbs the learning curve quicker. He was right: by operating the motorcycle closer to its limits, I enhanced my skills much quicker, and while I intend to ride much less aggressively on the street, the skills should come in handy. It’s just like autocrossing in a car makes one a better driver on the road even though he won’t (or at least, shouldn’t) be instigating 0.90g slides around a corner in everyday situations. At the end of the last day, we had a riding test for the above skills. As with the written test, the result was similar to that of my 1999 class, meaning that I passed but not with flying colors. I got dinged for decelerating slightly through a corner (a result of approaching it too exuberantly! ), and not braking early enough in the emergency stop maneuver (a result of being constantly scolded during the practice sessions for braking too early—which, I’d argue, is desirable on the street). So there are plenty of things I need to work on during my own practice time. Now if I just had a bike!